The entrance to a new residential or commercial development is being landscaped. The orange-red dirt has been graded perfectly flat and compacted, the landscape crew is using a power auger to drill holes for the shrubs and is laying squares of sod right on top. I watched the landscape above several months afterwards and have seen dead shrubs replaced more than once. Somehow, the message didn't get through that the plants really don't like being entombed in this clay soil, which has hardened to clay pot strength. The clay soil pictured above is the subsoil that was left after the topsoil was scraped off during the grading process. Although clay soil is rich in nutrients, the soil particles are so tightly bound together that the nutrients are locked up tight and unavailable. Roots have a difficult time penetrating into the surrounding area. Red clay also takes a long time to absorb moisture and once wet, takes forever and a day to dry out. Factor in low oxygen levels in the soil and you have a complete recipe for plant death. When faced with this problem, the best thing a home or business owner can do is insist that the soil be amended. 40 pounds of either Black Kow or Mushroom Compost. I mix this together in a wheelbarrow. I then take a shovel and break up the existing clay soil before adding a three inch layer of the mixed amendments over the entire area to be planted, not just each individual planting hole. At this point, you can plant or rototill the entire area further mixing the amendments into the existing soil to a depth of 8 inches. 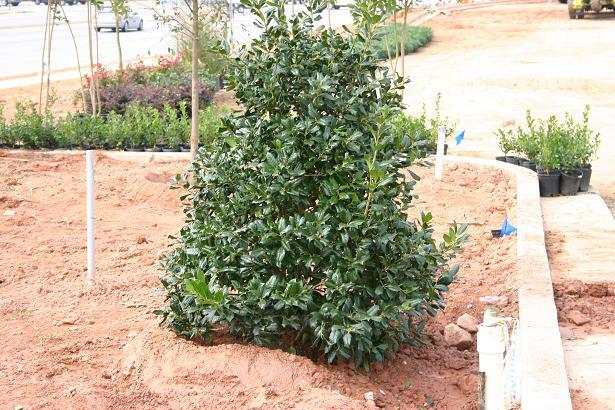 When installing plants, remember to dig a hole that is 2-3 times the diameter of the root ball and it's usually best to plant a bit high. 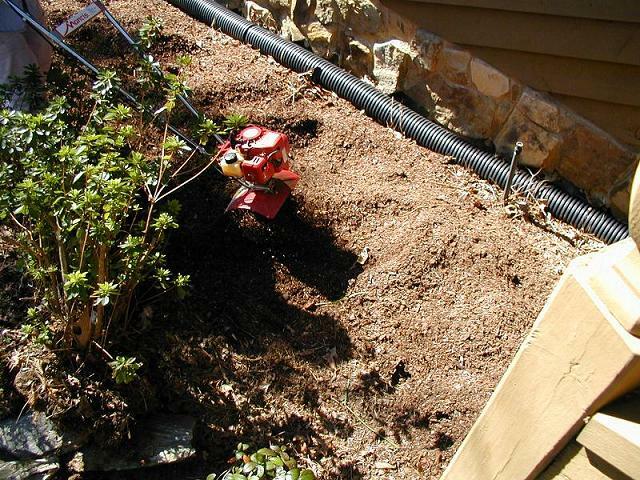 Once the plants are installed, don't forget to mulch the entire area.